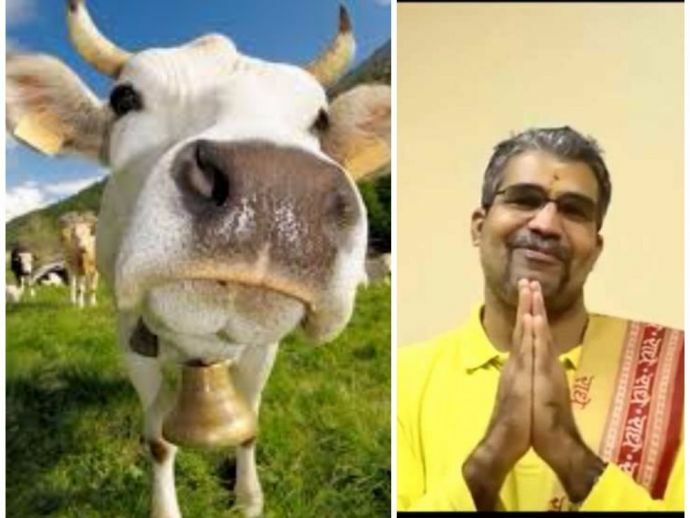 This Kerala Godman's Theories About Cows Will Leave You In Splits! 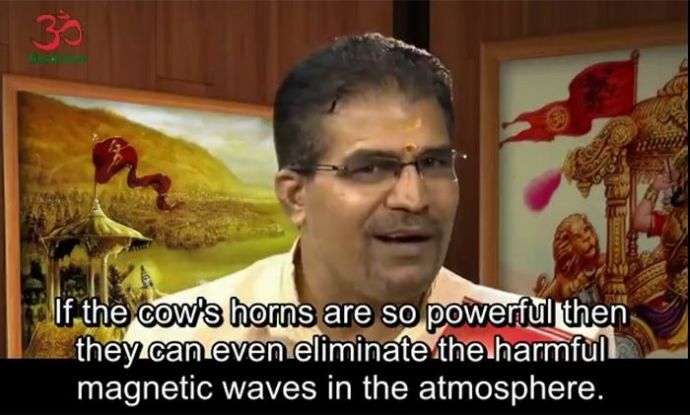 Swami Udit proclaims cow horns absorbs radioactive waves and many such theories. We all knew cows are considered pious and majorly gave us milk (I am going to stop at that before anyone leaps in with a stick already!). But my beliefs were proved wrong by a Kerala godman. This godman just gave the world a horde of other uses and benefits of cows, which might defy science, biology, nuclear science and what not. But hey, who cares, after all it has come from the mouth of a godman and no one can defy that, right? 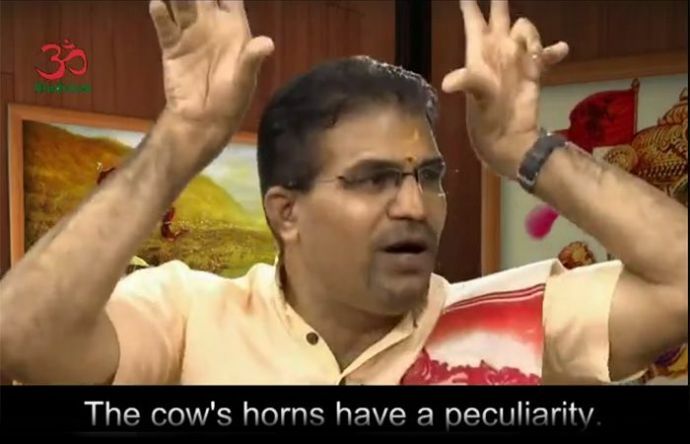 So, according to our godman, Swami Udit Chaithanya, founder of a spiritual retreat called Bhagavatham Village, cows have certain “peculiarities”. We bet you didn’t know that. 1) Cows' horns can absorb radioactivity! Yeup! He said that. Just when I was digesting that, he suggests, “If you place an FM radio between the horns of a cow, you won’t hear the programme. Just the hmmm noise.” Hmmm! 2) Cows reduce the sound waves into “Om”. Guess it’s all of us who need some ‘Om’ chanting to take this news in! 3) Cows can eliminate harmful radiations in our environment! So our holy cows can even do what our scientists have pretty much failed to do. Remove unwanted magnetic waves in the atmosphere! That’s it, I’m getting a cow, like right now! 4) Want some BS? Sorry, cow dung, I meant! 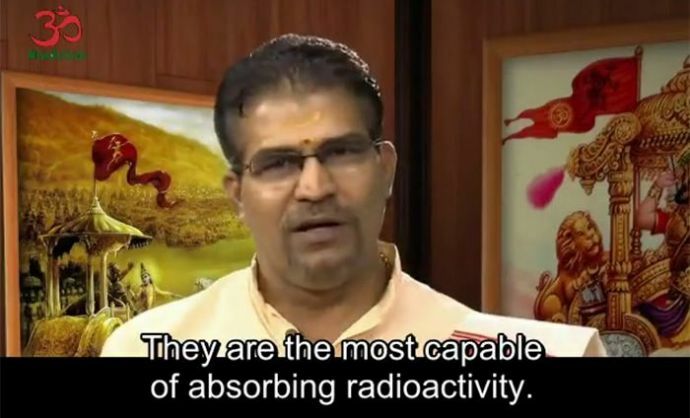 Just when I was thought I was done, Swami ji started off that how the Plutonium needed at atomic power station, is found in cow dung! Did you guys too let out a s-cow-l?! 5) And finally, cure to cancer found! Swami ji has done it again. 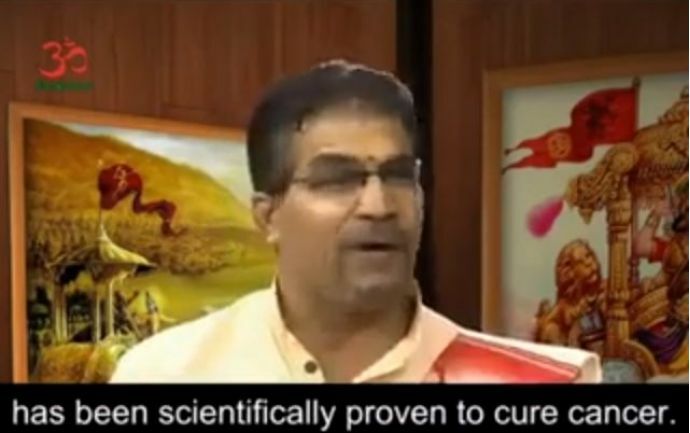 He proclaimed that cow’s urine is the ultimate cure to cancer! Wish we knew this earlier, we’d not have let our cows pee on the streets! Frankly, we are not even surprised. After 'Peahen swallows tears of the peacock to get pregnant' and 'Cow exhale oxygen, absorb cosmic energy', we can pretty much expect anyone from a High court judge to a Godman, to flout logic and science shamelessly! Here's where you can watch it for yourself.